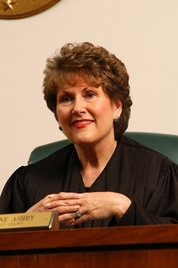 Anne Ashby served as District Court Judge for the 134th District Court in Dallas County for 20 years. She presided over hundreds of jury trials and bench trials and thousands of hearings covering civil and commercial litigations. Her universal experience brings a wealth of knowledge and reality to the arbitration and mediation process. Judge Ashby stands out from the rest of the field of professionals because of her skill in communication. She is sought out as a mediator in potentially volatile situations because of her strong, yet calming influence and well-designed strategies and methods. She has a special sense for intuitive understanding of highly emotional disputes. Not all mediators can "read" and size up a mediation like Anne Ashby can. She vigorously over-prepares, rehearses her strategy and implements a plan for resolution, always sensitive to the time and investment of her clients. She is level-headed and listens attentively. As an Arbitrator, Judge Ashby helps the parties funnel the issues efficiently to resolution. She carefully listens to the arguments, reads the pleading, briefs and cases, follows the law and artfully drafts the Award... all confidentially and without the drama of a jury trial. Anne's calming and re-assuring attitude when working with witnesses for courtroom testimony helps witnesses bring credibility and comfort to the stand. She shows them how to navigate the minefields in the courtroom and prepares them for the grenades that are likely to come their way! Ashby is a Life Founding Fellow of the DAYL, a Dallas Bar Foundation Fellow and Charter Member, and a Texas Bar Foundation Life Fellow. She served on the State Bar of Texas' ADR Section Council. She serves on the Commercial, Healthcare & Judicial Panel of Neutrals with the American Arbitration Association. Anne is married to Dr. Michael Duren, a cardiologist and internist. Together they share two children and four grandchildren and two phenomenal dogs named Jade and Scarlett. They recently added a feline variety named Pijit to the family, much to the disdain of the dogs. Anne has mediated a couple of spats in their backyard in Dallas pro bono and successfully. Disposition of 21,498 cases; 244 tried to a jury verdict.